In general Polyboard cabinet size is the total external size so over hanging parts are included in the total size. To make a part stick out of the overall size you can use a grooved assembly. In this way the cabinet stays the same size and the top will protrude outside the total volume. Hello!I am making a piece of furniture,and I want the top part of this to depass the other pannels by 50 mm(sides,back and front).how can i make the top bigger than the rest of the furniture,without loosing the 50 mm on each side of the furniture after I enlarge it? For instance,lets say I have a cabinet with height: 900, width 600,depth 500 and 19 mm pannel. 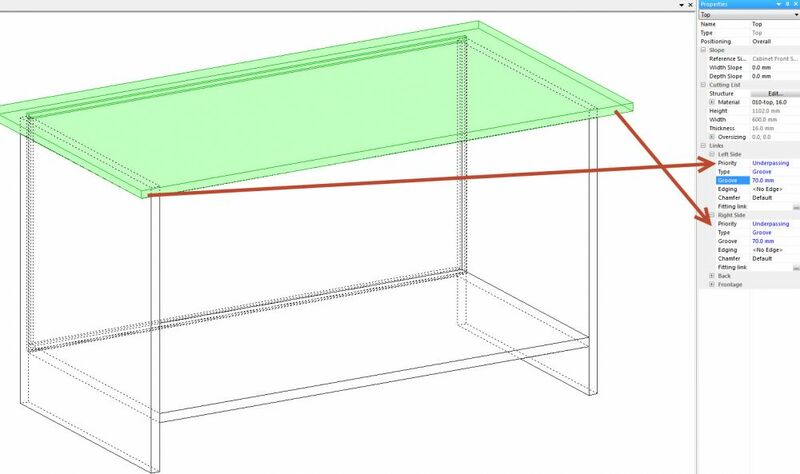 I want the top to depass by 50 mm on the front,sides and back,but without reducing the volume of my cabinet?i tried using links/overlap,but this is reducing the volume of my cabinet and I dont want to…can it be done,or do I have to increase the size of my original cabinet by 100 mm on depth and width in order to have the needed messures after I make the top to depass the other pannels?thank you!